Jean reviews Quick & Easy Stitched Jewelry, 20+ Projects to Make, by Cathy Jakicic--it's wonderful! 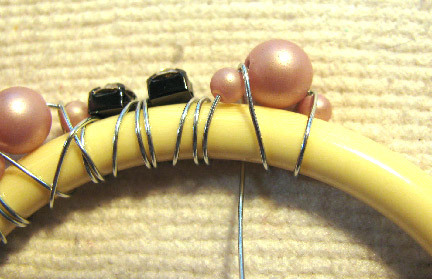 Learn how to make these easy wire headpins that have three wire loops on the end. Using worsted weight yarn and a spool knitter, you can make bulky yarn that you can then knit with. 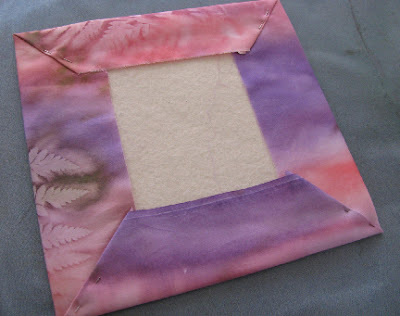 A great stash buster! If you have or know a model mom who does her very best for her kids and sets an example you admire, tell her with a "priceless" dress card like this. The Dutch spiral is not so much a stitch as it is a series of stitches. 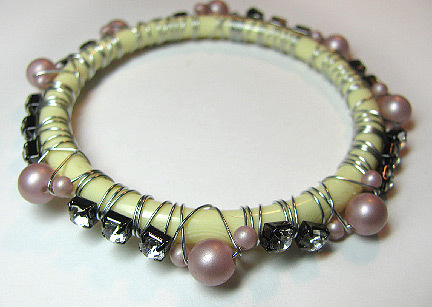 A combination of peyote and netting, the Dutch spiral is a soft, stretchy tube with beautiful drape. 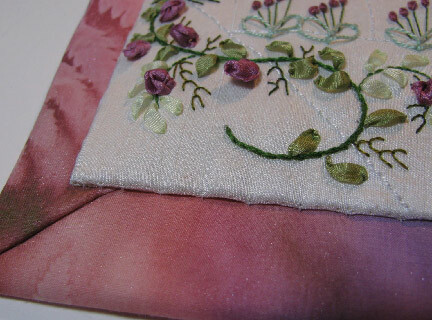 Choose your thread color carefully and hold it firmly while working to help keep up the tension. 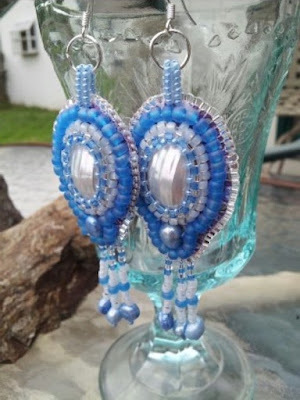 There are two parts to the spiral: the peyote section is sometimes collectively called the core beads, and the netting section is created by a loose length of seed beads and accent beads. I suggest using differently shaped or colored beads for the core beads and the netting, at least until you're familiar with the sequence. I really like Delicas for the way they fit together to make a nice tighter core section, and regular donut-shaped seed beads for the netting. There are many different ways to do the Dutch spiral, but having tried quite a few of them, here is my take on the easiest way to get started. 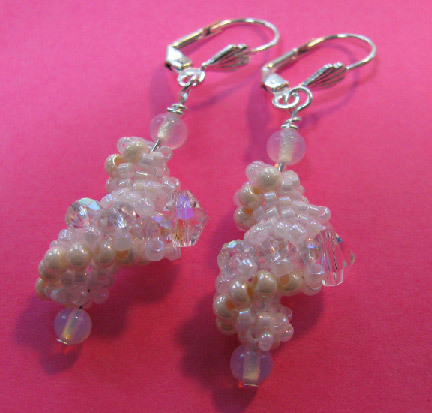 Once you've mastered it, you can increase and decrease the netting portion to make pretty undulating shapes like in the earrings I made, shown above. Next week, I'm sharing the tutorial for putting the earrings together! 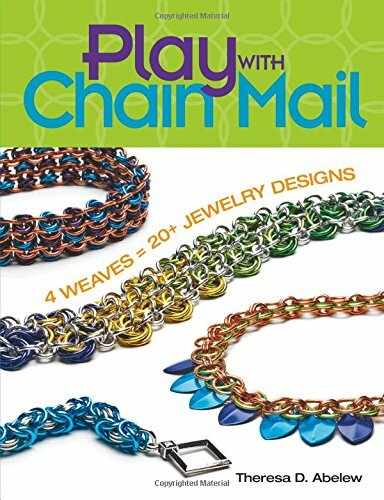 Row 1: Pick up a size 8/0 seed bead (8) and loop the thread through it again to form a stop bead, leaving a tail of at least 6-8". 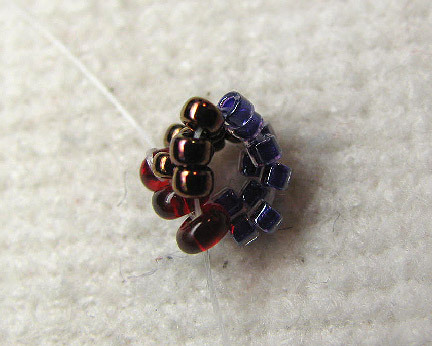 Pick up 6 Delicas (D) and 3 size 11/0 seed beads (SB). 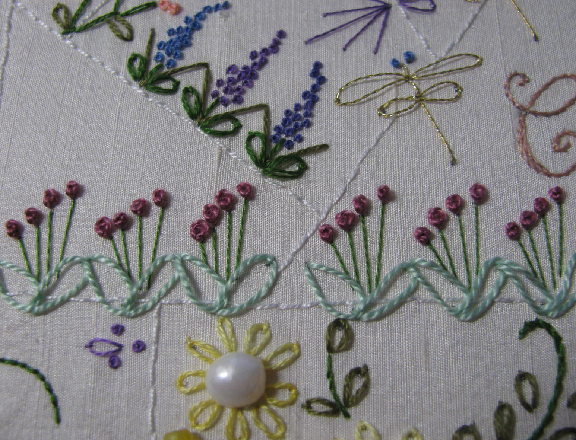 Stitch through the 8 to form a loop. 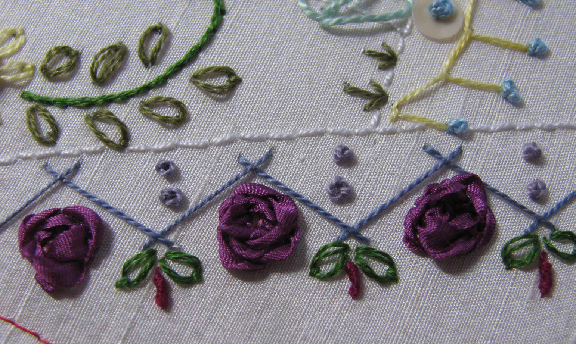 Row 2: Pick up an 8 and stitch through the 2nd D. Pick up 1D and stitch through the 4th D. Pick up 1D and stitch through the 6th D Pick up 1D and 3SB, and stitch through the 8 added in this row. 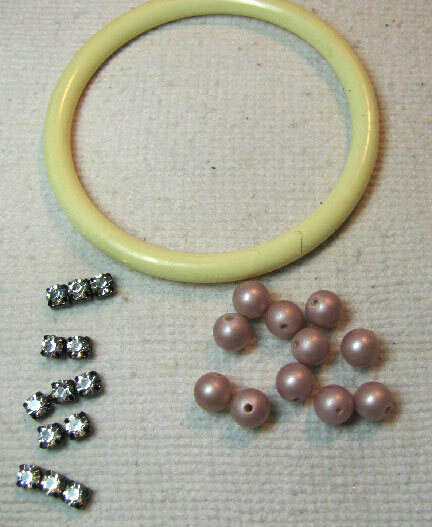 Make sure these netting beads sit on top of the netting beads from Row 1. Row 3: *Pick up an 8 and peyote stitch through the 1st raised D. Pick up 1 D and peyote stitch through the 2nd raised D. Pick up 1D and peyote stitch through the D added in the netting stitch of Row 2. * Pick up 1D and 3SB, and stitch through the 8 added in this row. 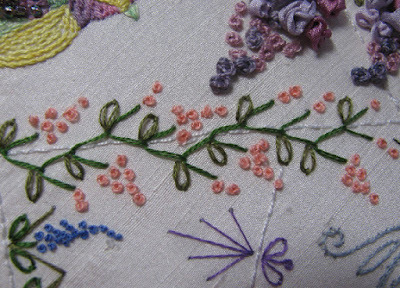 Continue to make sure each new netting stitch sits on top of the netting stitch of the previous row. 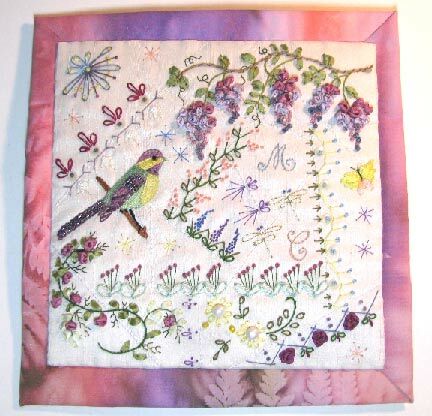 Row 4 and following: Repeat *the peyote section* of Row 3. The netting stitch for each new row can be continued like Row 3 for a symmetrical rope, or it can be altered, making it longer with more seed beads or additional embellishments. 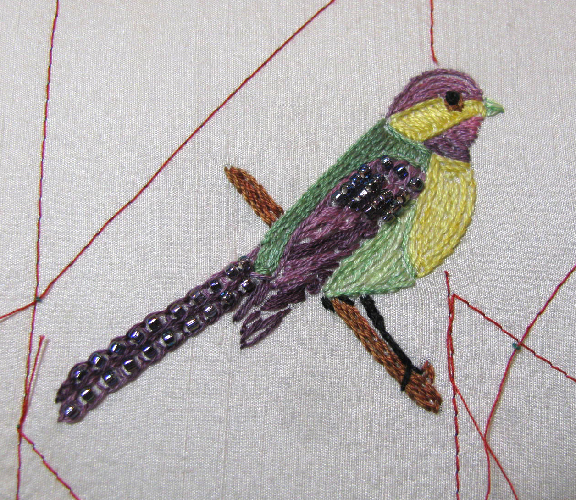 Choose a thread color that won't stand out. 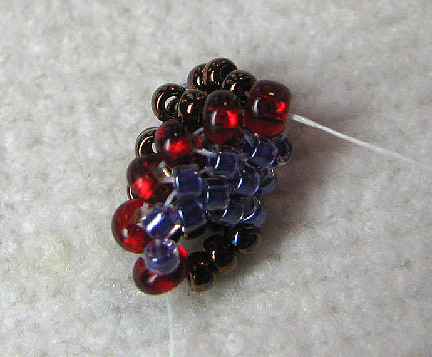 You can see in my sample that the white thread is quite visible in between some of the beads. And my tension is fairly firm! Hold onto the tail to help control tension. 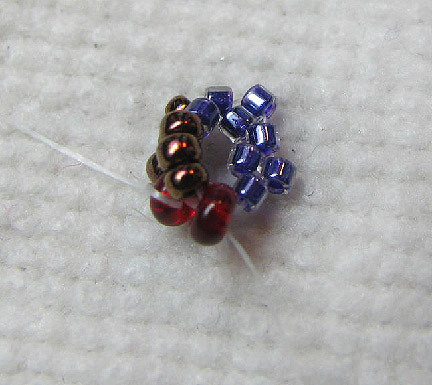 To keep track of your beads, add the same type of bead you have just exited. There is no peyote "step up". 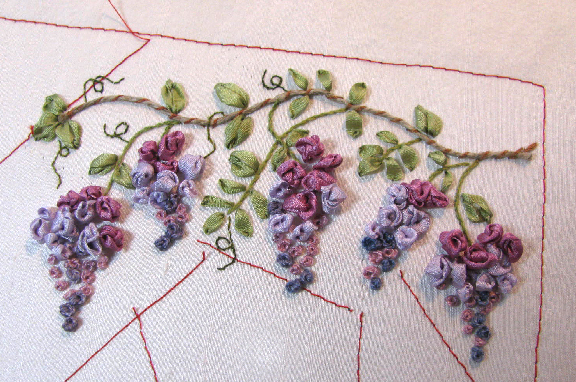 Simply stitch through the 8/0 added earlier in the row and begin your next row. Use the 8/0's to count the number of rows! You will see the spiral begin to form by Row 5 or 6. 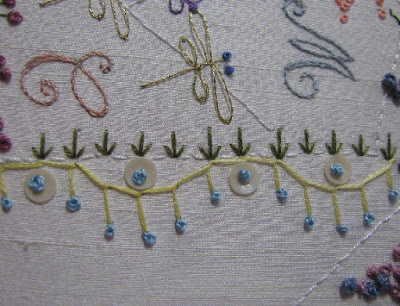 Weave your thread tails back into the beadwork when you are done. 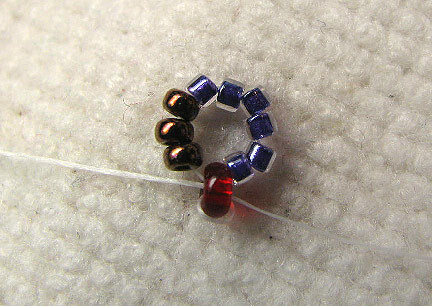 Don't forget to undo the loop from the first stop bead! 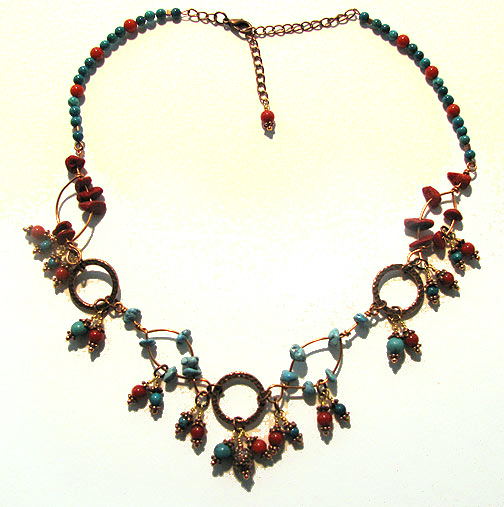 Hammered copper links form the focal points for this delicate but arresting necklace. 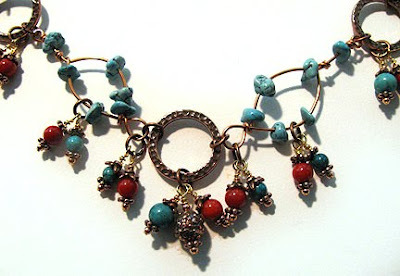 Coral and turquoise, in both round bead and chip form, bring out the burnished beauty of the metal. Copper Canyon adjusts from 17 to 20 inches. The dangling beads give this fun necklace lots of movement. 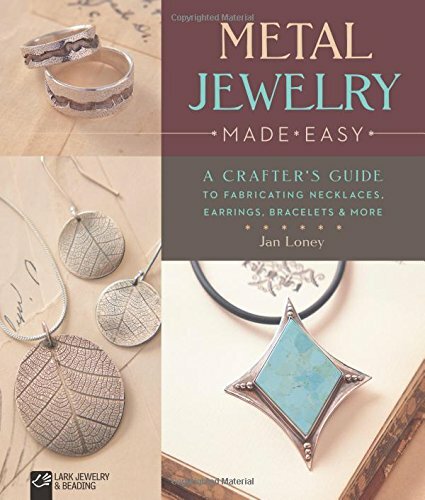 There are many many beginner books out there, and there are even lots that have easy and attractive projects to create. 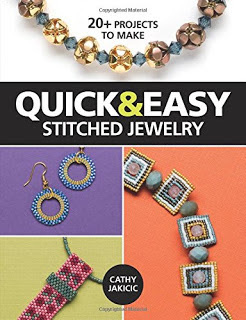 Quick & Easy Stitched Jewelry, written by Cathy Jakicic and published by Kalmbach, has a bit of a bonus feature though. 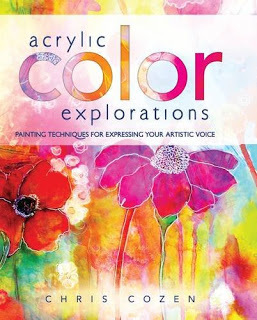 Cathy has generously designated all of the projects in this book as royalty-free. 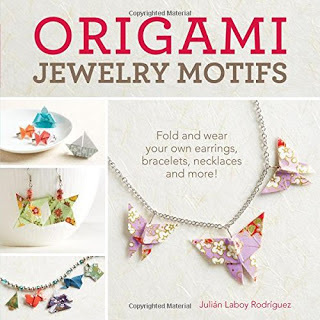 Not only can you make them for yourself or as gifts for others, but she encourages you to sell them if you wish. Rather than concentrating on just one stitch, this collection gives you ideas for many...peyote, square, ladder, herringbone, RAW, and bead embroidery. 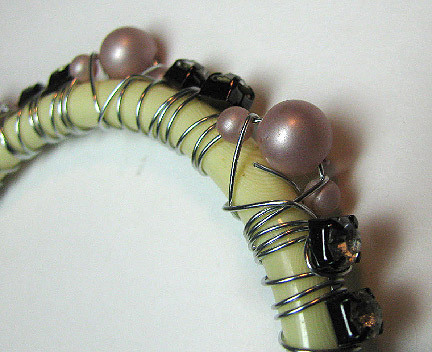 Plus, there are instructions for the basic wirework you will need for constructing the finished pieces. I have bags and bags full of cast off jewelry from flea markets, yard sales, and generous friends. Recently, I was looking at a bag full of plastic bangles (the hard plastic kind), and I thought about using cup chain on it in a similar way to the Shamballa bracelets I was making last year. 1. 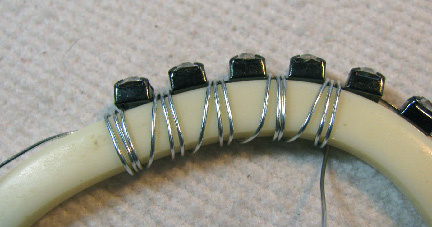 Leave a short tail as shown and wrap three times between each "stone". 2. 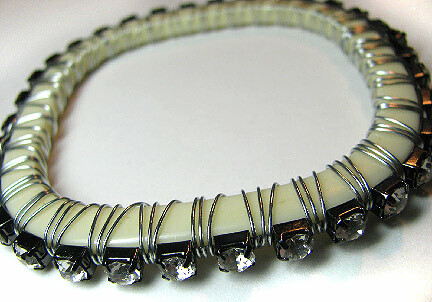 Wrap over the tail and tuck the other end underneath a wire as best you can. 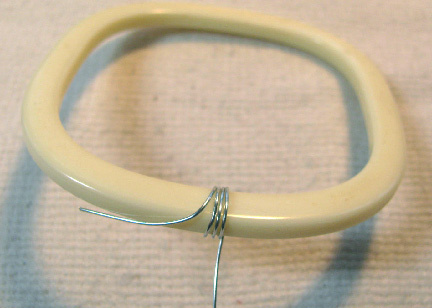 Squeeze gently with chain nose pliers to secure.